An iPhone with a 5.5-inch display? A few years ago, it seemed as though Apple would never relent to doing such a thing -- after all, a 3.5-inch display was more than sufficient at the time. In 2014, however, it's a bit of a different story. There's a wide variety of phone sizes out there, and a lot of different markets that Apple could appeal to by offering a large device. With the iPhone 6 Plus, Apple is now able to address those who don't mind using a big phone for its extra screen real estate and larger battery. We had the opportunity to play with the Plus for a spell after Apple's keynote this morning, and it's got a bright future ahead. Check out our photos and video below as we continue to bring you our thoughts on the giant iPhone. First, the elephant in the demo room was the phone's size. After all, 5.5-inch screens won't appeal to everyone, especially folks who have been used to 3.5- and 4-inch iPhones for the last seven years. But we brought a 5.7-inch Samsung Galaxy Note 3 with us to compare, and while the Note takes advantage of the S Pen and its litany of features, it's also just a tad wider and thicker than the Plus. Apple's version also benefits from having curved edges that are actually easier to grip onto than I was originally expecting; I'm used to carrying phones with large displays, and the iPhone 6 Plus is just as comfortable to hold as most other devices its size. As for the display itself, we're looking at a resolution of 1,920 x 1,080, which equates to a pixel density of 401ppi. Compared to the smaller iPhone 6, which features a 1,334 x 750 resolution for 326ppi, it's supposed to be a better experience. With it being a brief hands-on, I wasn't able to notice a large enough difference between the two; both looked sharp, clean and had great viewing angles. I'll be able to go into more detail when review units grace my desk, but for now, I'm satisfied enough with the visual quality, and I doubt the difference in pixel density will be a critical factor when choosing between the two sizes. The display, which Apple says is made with "ion-strengthened glass," (nope, it's not sapphire) is also slightly curved as it meets the sides; this isn't anything new in the smartphone world, as quite a few devices come with 2.5-dimension glass, but it's a nice touch since it equates to a smooth swiping experience. This should come in handiest for swipe gestures and the new iOS 8 keyboard. While the iPhone 6 and the Plus are essentially identical in hardware and software, there are a few minor differences. The Plus is marginally thicker (7.1mm versus 6.9mm), but it's still thinner than the iPhone 5s, and the hand-holding experience won't be any different when all you're looking at is a 0.2mm delta. It's also got better battery life: Apple claims that it'll get you 24 hours of talk time, whereas the iPhone 6 will only get 14. (If you're planning on buying a new iPhone, this may very well become one of the most critical factors in determining the best size for you.) Additionally, the Plus comes with a special one-handed mode and landscape option in the Springboard, and it's also blessed with optical image stabilization (OIS) on the camera. With the larger size, Apple determined that it made more sense to put the power button on the right side of the phone, rather than the top. This makes a lot more sense, as it would be much more difficult for anyone's fingers to reach there on a regular basis; its new location makes it easier to reach. 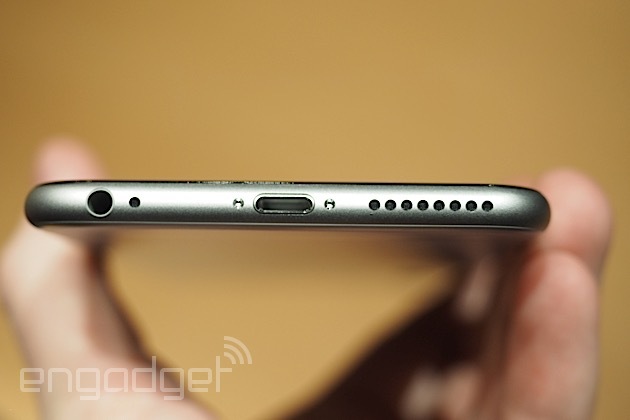 The Lightning charger port, mic/speakers and 3.5mm headphone jack are on the bottom, and the volume rocker and mute switch adorn the left. The top of the iPhone is left completely bare. You'll see a couple strips on both the left and right sides for the antenna, which carries over to the aluminum back. 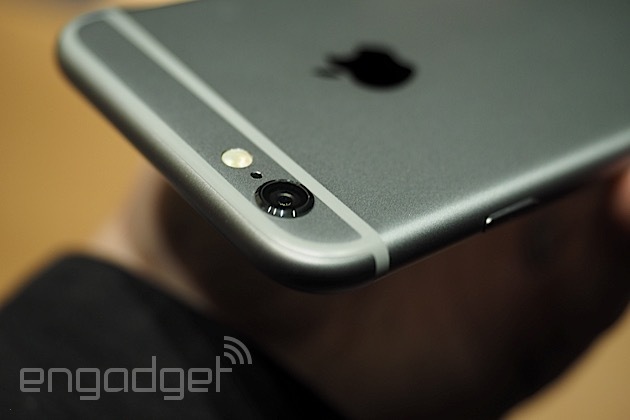 On the front, you'll also get the same Touch ID button as usual. 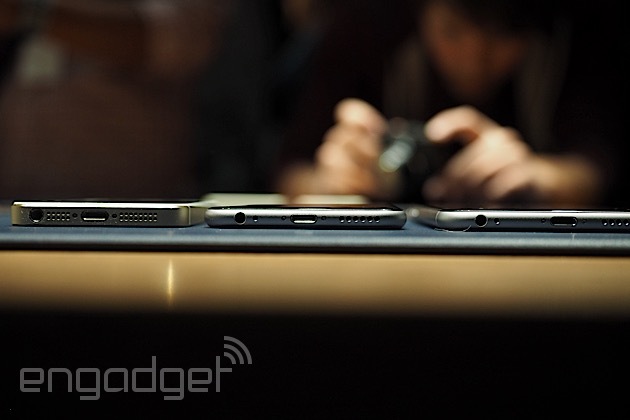 As for the back, there are a couple of strips that actually remind me of the HTC One's setup. The camera and True Tone flash are on the top. Unfortunately, one of the compromises Apple had to make in exchange for a thinner chassis is a camera module that sticks out from the rest of the body of the phone. For those who get a kick out of the iconic logo on the back of each iPhone, an Apple rep told me that the logo itself is made of stainless steel. One of the software features that's unique to the Plus is the one-handed operation mode. Tap (don't press) on the Touch ID button twice and the screen will flatten to the bottom half of the screen, leaving nothing on the top. You can still do the same actions in this screen; you just won't have the same amount of screen space. One more tap on Touch ID, and it goes back to normal mode. Another unique feature to the Plus will be optical image stabilization, which should help you in low-light shots and shaky videos; aside from this, the same camera enhancements apply to both the iPhone 6 and 6 Plus (we have more details in our iPhone 6 hands-on). As is Apple's tradition, we don't have a lot of stats on the new A8 processor initially. Just like the A7 that came in the 5s, it offers 64-bit support; it's also smaller, has more transistors and comes with the new M8 motion coprocessor that's a step up from the M7 used on the previous iPhone model, which comes with a barometer, gyroscope and accelerometer to keep a close eye on your activity. Of course, the Plus will also come with Near-Field Communication (NFC), which makes it possible to use wireless payments through Apple Pay. I discussed Apple Pay in greater detail in my iPhone 6 hands-on. The iPhone 6 Plus will start at $299 on-contract for the 16GB version, while the 64GB option is $399 and 128GB is $499. There are three color options: silver, gold and space gray. Preorders of the iPhone 6 Plus begin on the 12th and it'll be available in stores and online starting on the 19th.